Dragon’s Treasure online slots casino game features fire-breathing dragons who guard hoards of treasure. But don’t despair, you have knights on hand to help you seek and find the treasure hoards in this game. German company, Merkur Gaming, began in the 1950s – with Paul Gauselmann who founded the Gauselmann Group way before online games took off. Merkur is their brand for online offerings now and was founded in 1974 and delivering their first slot – Merkur B – in 1976. Merkur’s many years of experience in the games industry has meant their name represents quality, innovation and entertainment. Dragon’s Treasure online slots has a5 reel, 3row, 5 fixedpayline format. This slot is all about the knights fighting dragons to get the treasure the dragons are hoarding. At the bottom end of the paytable are the usual playing cards, then there is the closed treasure chest and sword in the middle of the paytable. At the top are a dark knight and a blond knight (who pays most). Click i to view the rules and $ to view the paytable. Select your bet (from 0.5 to 100.00) or click Max if you want to stake 100.00. You can play auto by clicking Autoand choosing a number of spins. Then click Spin. You can stop the autoplay by clicking Stop at any time. Or you can spin manually one spin at a time if you prefer. If you have already set up for autoplay you’ll need to select Auto and choose 0 spins before you can spin one at a time. DRAGON – substitutes for all symbols and spin three or more and you’ll win ten free spins. The dragon also wins you a payout of 0.20 for three, 2.00 for four and 20.00 for five. Not bad. Triggered by three or more wilds, you will win ten free spins. Before starting the free spins, pick a symbol to be an expanding wild in the freebies. Then if you spin two or more of this symbol you’ll find it expand to fill the reel and give you more potential for winning combos. Not available in auto play or in free spins game, but available for a limited time if you spin and win in manual play, you can choose to take the money or gamble it. To gamble, you can guess a card colour by clicking Hearts or Clubs or you can guess whether you will move up the cash ladder or not, by clicking the ladder symbol. 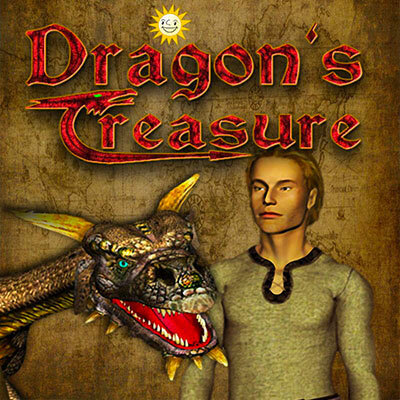 Dragon’s Treasureonline slots casino game is a solid game but limited in scope because of the lack of bonus features. The wild does offer a payout (like a scatter) and during free spins you get an expanding wild of your choice of symbol so it is enjoyable enough but after a while you may look for a more variety elsewhere.